Franklin, Tennessee where history and progress exist harmoniously. Franklin. A beautiful blend of upscale urban development and historic preservation, numerous selections of places to dine, shop and explore history, it’s no question why Franklin was listed as one of the top 10 “Best Small Towns”, in the Southern Living magazine. • #10 for new jobs created in America and projected to be 3rd in America for new jobs over the next twenty years. Franklin is 14 miles south and 100 years from Nashville. The Nashville Suburb is named after the American statesman, Benjamin Franklin. Nashville area residents discovered Franklin’s quiet peaceful atmosphere, which created a growth that spurred the developments of many beautiful Franklin neighborhoods. Neighborhoods boasting Victorian and Craftsman style homes found in Franklin’s downtown area. 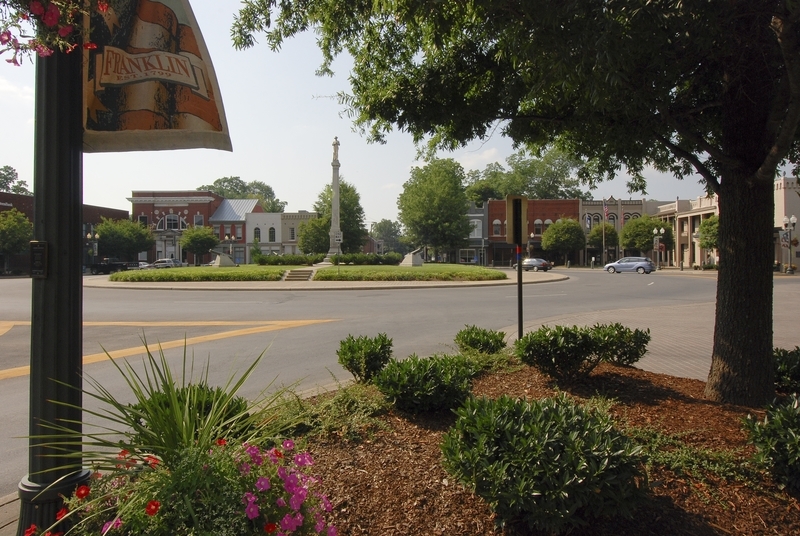 Downtown Franklin, is an oasis of southern hospitality. Visitors enjoy the beautiful 15 block historic district as well as the unique shops lining the downtown streets with a variety of restaurants, clothing boutiques, gifts and gallerias. Downtown is well known for its annual festivals. There is the Main Street Festival in the spring, Fourth of July in the summer, PumpkinFest in October, the Veterans Day Parade in November, and the Dickens of Christmas in December. Williams County Schools rated #1 as Best School District in Tennessee. For the Historic Battle of Franklin Tour visit the The Carter House and Carnton Plantation, McLemore House and the Civil War House Mueseum the Lotz House. If you would like to participate in the yearly dance party, prepare for the Franklin Heritage Ball in advance. For local Park Locations and Maps, click on this Franklin Parks Link. Part of the beautiful Franklin area is the Natchez Trace Parkway. You can find scenic drives, hiking, biking, horseback riding and camping options along the trace. Make Middle Tennessee’s greatest community your new home. Since Franklin is only 14 miles south of Nashville, it allows the local residents to enjoy everything from both worlds. Franklin residents can enjoy the charming city of Franklin as well as everything Music City has to offer. You can find anything from historic homes to modern developments, in Franklin. One of the many attractions to this particular area, are the rolling hills and farms so close to the thriving metropolis of Nashville. This is a “shout out” for Elma! She definitely receives a 5 STAR rating from us. Thank you, Elma, for walking us through the process, which was made more difficult since we were acting on behalf of parents living across the state. You were professional, yet so congenial, so extremely helpful … always going the extra mile. We hope we have many, many opportunities to refer others to you!